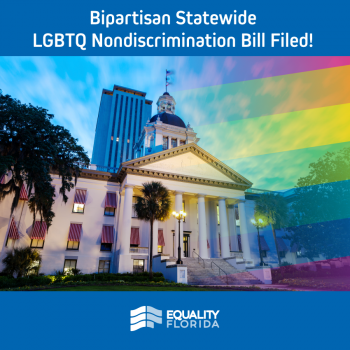 Tallahassee — Today Senator Darryl Rouson (D - St. Petersburg) and Representative Jennifer Webb (D - St. Petersburg) filed HB 485 and SB 430, comprehensive legislation to protect gay, lesbian, bisexual, and transgender Floridians under Florida’s existing Civil Rights Act. The Florida Competitive Workforce Act, which establishes LGBTQ non-discrimination protections in housing, employment, and public accommodations, is expected to earn unprecedented bipartisan support and begins the session with the support of Florida’s largest employers. Filed last session by Senator Darryl Rouson and Representative Ben Diamond (D - St. Petersburg), the Florida Competitive Workforce Act has consistently garnered tremendous bipartisan support. With 69 Democratic and Republican sponsors and cosponsors, it was the third-most sponsored bill of the 2018 legislative session. Currently, comprehensive local non-discrimination protections that include gender identity and sexual orientation cover nearly 60% of Florida’s population.